Sometimes not standing out can be the best way to get noticed. That’s especially true for NHL defensemen in today’s fast-paced game. 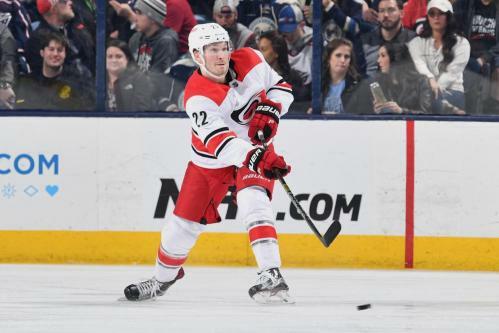 Brett Pesce may not be the most recognized name in hockey, but his play this year with the potentially playoff-bound Carolina Hurricanes has forced his peers to take notice. “He’s just really smart. I think that’s his biggest attribute,” said Hurricanes teammate Trevor van Riemsdyk. While the 6-foot-3, 200-pounder can be classified as a defensive defenseman, Pesce pushes the envelope in the new-age NHL with his ability to skate the puck out of the zone as well. His offensive prowess – 24 points (6 goals, 18 assists) so far this season, a career-high– has also earned some recognition. Currently in his fourth NHL season, the Tarrytown, N.Y., native is a jack-of-all-trades defenseman. And with a team-friendly deal -- $4.025 million for the next four years – he is beyond a bargain blueliner. Pesce has become a core component of Carolina’s defense, a unit that is among the best in the league. They added another dimension this offseason with the acquisition of defenseman Dougie Hamilton from Calgary, along with Micheal Ferland and Adam Fox for Noah Hanifin and Elias Lindholm. Pesce has played alongside three-time NHL All-Star Justin Faulk for most of the season. Despite playing primarily his off-side, Pesce has continued to flourish for Carolina. A right-handed defenseman, the trade put Pesce in a peculiar position, with Hamilton and Justin Faulk, also righties, pushing him down the depth chart. However, with his abilities clamoring for more minutes, coach Rod Brind’Amour moved Pesce to his off-side. Pesce, along with several others of his blueline battery mates, including Erie, Colo., native Jaccob Slavin, have excelled in keeping the oppositions high danger scoring opportunities to a minimum, setting the stage for goalies Petr Mrazek and Curtis McElhinney to flourish. The Hurricanes are analytic darlings, propped by an offense that generates the most shots on goal per game (34.8) and the second-fewest shots allowed (28.6). And while there are arguments against the effectiveness of the plus/minus stat, Pesce’s plus-28 is tied for 3rd among NHL defenseman. Not bad for a defenseman primarily playing on his off-side, although it’s been an adjustment he has taken in stride. Pesce honed his craft at the University of New Hampshire, playing for three seasons with the Wildcats. Van Riemsdyk was a sophomore when Pesce stepped onto the Durham, N.H., campus a few months prior to his 18th birthday. The pair of current teammates college careers overlapped for two campaigns, allowing van Riemsdyk a chance to observe a young Pesce come into his own. Pesce, positioned against Oilers superstar Connor McDavid on Feb. 15, helped hold the two-time Art Ross Trophy winner without a point, a feat only accomplished twice in the past two months. The analysis is spot on, especially when it comes to closing off oncoming rushers. With his stature and active stick, it’s a hard task to engage in board play and still emerge with the puck when posed against Carolina’s No. 22, his digits inspired by Hall of Fame defenseman Brad Park. 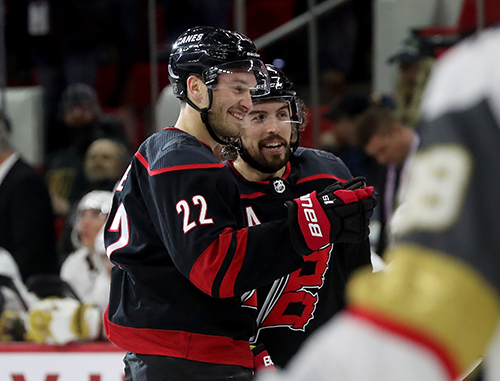 With the Hurricanes stifling defense, the veteran leadership of Justin Williams and Sebastian Aho on the brink of stardom, Carolina is looking to dismiss their playoff-less streak of nine straight seasons. The Raleigh-based group is currently occupying the first wild card spot with 87 points. Their play has garnered attention of late – a 24-8-2 record since Jan. 1 – the 50 points produced in that span the third-highest total in the league. Much has also been made of the way they’ve celebrated those wins when they’ve occurred at home in PNC Arena. It’ll be interesting to see if a ‘Storm Surge’ in the playoffs rekindles any ammunition directed towards the post-win celebration in the coming weeks. 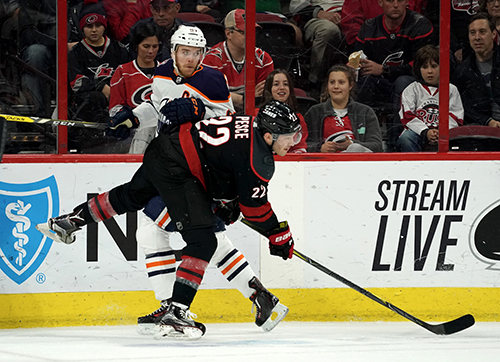 Though one thing is for certain as the games begin to matter most, Pesce will play a massive role, whether gaining widespread recognition or not as the Hurricanes push into the postseason.